The NJOY Daily is also available in tobacco, menthol, and fruit flavors. 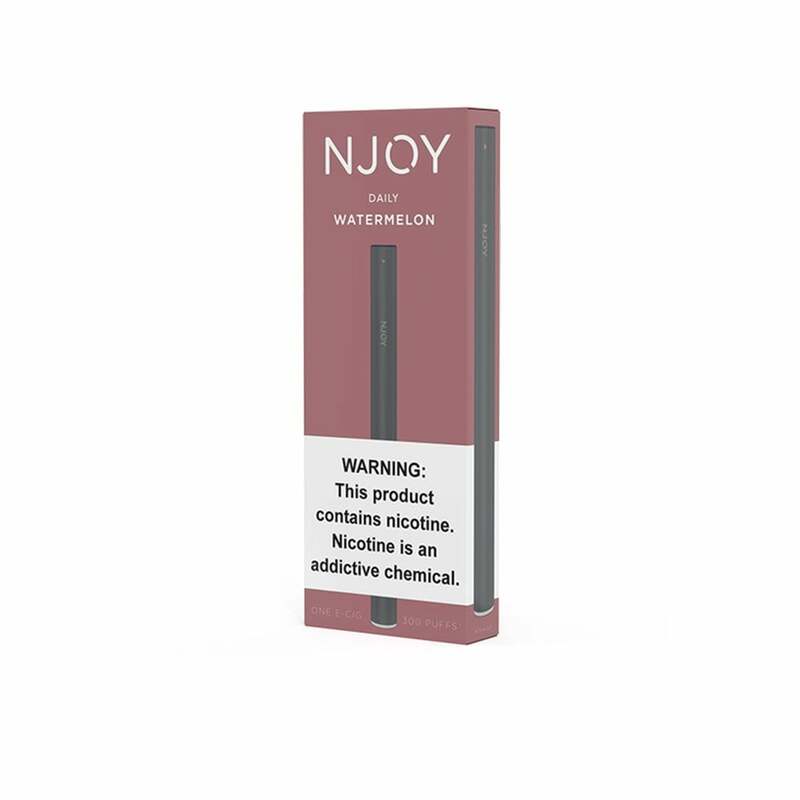 An alternative to the regular tobacco and menthol flavors, NJOY watermelon offers a sweeter alternative without sacrificing any nicotine hit. Enjoy the taste of sweet, juicy, watermelon now available in a convenient disposable e-cigarette. If you're a fan of the fruity NJOY Blue + Blackberry, try NJOY watermelon for a delicious change. Just ok. Flavor wasn't outstanding, weak vapor. The battery lasted for a very short time. Also, the draw is very weak and it produces little vapor. I like watermelon when I want fruity but nots too sweet. The Njoy Daily watermelon disposables are good, they smell great, they taste decent and last at least a days worth of heavy puffing. I love there ecigg watermelon flavor, OMG they are the BEST ordered four of them at 5 pm my time I got a email saying they were shipped two hours later, then received my package in 2 days I was so happy for the fast service they provided. Daily Watermelon tastes just like watermelon so if you like watermelons buy it. Love the flavor. They have a good throat hit too. They are very inconsistent in functionality. I get some that don’t work at all, some that light up and stay lit causing them to get hot and others that only work a few puffs and just stop working. Sometimes I have one that lasts me two days and others die after half a day. If it weren’t for the flavor and convenience of being disposable I would have given them up. Very good quality ecig and great flavor. Amazing products and fast shipping!